New Jersey's largest newspaper offered what could hardly be considered a ringing endorsement for Sen. Bob Menendez (D., N.J.) on Sunday, calling him "awful," corrupt and narcissistic in an editorial, but still preferable to his Republican challenger. In spite of his corruption case regarding a friendship with Florida ophthalmologist Salomon Melgen that resulted in a mistrial, the Star-Ledger editorial board urged readers to "choke down their reluctance and vote for Menendez" because GOP candidate Bob Hugin was no better and would not provide a check on President Donald Trump. "The question is which candidate can best fight Trump's toxic policies, his grotesque appeals to racial and ethnic tribalism, and his corrosive attacks on the pillars of our democracy, starting with the rule of law," the board wrote. 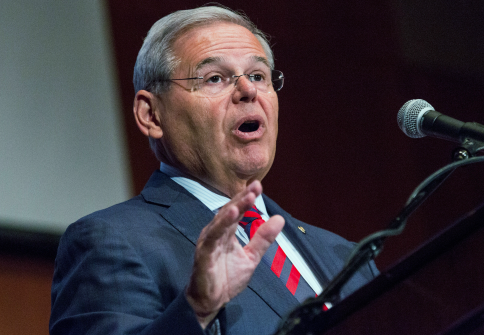 "That makes this an easy decision: Menendez is the better choice, by far. He has our endorsement." It called the race a battle between "two awful candidates whose most convincing argument is that the other guy is unfit to serve." The Star-Ledger ripped Hugin for being unclear on some of his views, his background in the pharmaceutical industry, and being a supporter of Trump's. It praised Menendez for his role in drafting the Affordable Care Act, also known as Obamacare, as well as his stances on climate change and immigration reform. Nevertheless, the board was unforgiving in its assessment of Menendez's conduct with Melgen and called it an "act of profound narcissism" that he stayed in the race for re-election. "Before he was caught in 2015, Sen. Robert Menendez broke Senate rules by routinely accepting expensive gifts, including private jets to luxury resorts abroad," the board wrote. "He kept those gifts secret, breaking another rule. He then used his office to promote the personal and business interests of the man who paid the bills. All that was the unanimous conclusion of the Senate ethics committee, including all its Democrats." "It's a miracle that Menendez escaped criminal conviction, and an act of profound narcissism that he stayed in the race despite this baggage, putting a Democratic seat at risk while Donald Trump sits in the White House," it added. The board also expressed annoyance that top New Jersey Democrats like Sen. Cory Booker (D., N.J.) and Gov. Phil Murphy offered their support to Menendez when another Democrat could have been nominated and perhaps had an easier path to victory. The non-partisan Cook Political Report moved the race to a "toss-up" last week. Menendez has never trailed in any polls but Hugin is nipping at his heels in a race Democrats cannot lose if they want to win back the U.S. Senate majority. "It's a disgrace that Democratic leaders like Sen. Cory Booker and Gov. Phil Murphy rallied to support Menendez early on, when a stronger candidate could have beaten him in a primary. This race is a rated as a tossup now, in a year when a generic Democrat could win in a walk," the board wrote. Their conclusion? Hold your nose and pull the lever for the Democrat. "Our hope is that voters remember that Trump is on the ballot, that they choke down their reluctance and vote for Menendez. He's no gem, but he's better than Hugin." This entry was posted in Politics and tagged 2018 Election, Bob Menendez, New Jersey. Bookmark the permalink.